H2O consists of the first and third most abundant elements in the solar system and is ubiquitous in the cosmos. 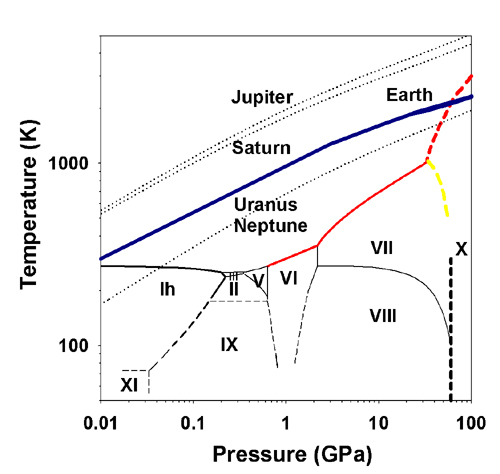 The phase diagram and properties of H2O at high pressure and temperature conditions relevant to planetary interiors are thus crucial for modeling planetary interiors and for identifying and understanding numerous chemical reactions at extreme conditions, yet there has been comparatively little direct information on the melting behavior of H2O at high pressures and temperatures (e.g., above 300 K at tens of gigapascals). Using in situ high P-T Raman spectroscopy and synchrotron X-ray diffraction, a team of CDAC scientists at the Geophysical Laboratory, Carnegie Institution of Washington and HPCAT at the Advanced Photon Source, Argonne National Laboratory led by Dr. Jung-Fu Lin, a research scientist at the Geophysical Laboratory, has observed a discontinuous change in the melting curve of H2O at approximately 35 GPa and 1040 K. The melting curve of H2O increases significantly above 35 GPa, indicating a triple point on the melting line. The report will be published shortly in Geophysical Research Letters. The discovery has been applied to understand the physics and chemistry of planetary interiors such as Neptune, Uranus, and Earth. Similar results obtained using high P-T Raman scattering and theoretical calculations have been recently reported in Physical Research Letters by CDAC collaborators from Lawrence Livermore National Laboratory (pdf). The steep increase in melting was unexpected. Measurements of the melting curve of H2O at extreme conditions have been controversial for decades because of the different experimental techniques used in detecting melting in H2O. Two years ago, the team first used in situ Raman spectroscopy together with an externally-heated diamond cell to directly measure the melting curve of H2O up to 22 GPa and 900 K using OH-stretching bands and translational modes of H2O. These results were reported in the Journal of Chemical Physics in 2004 (pdf). 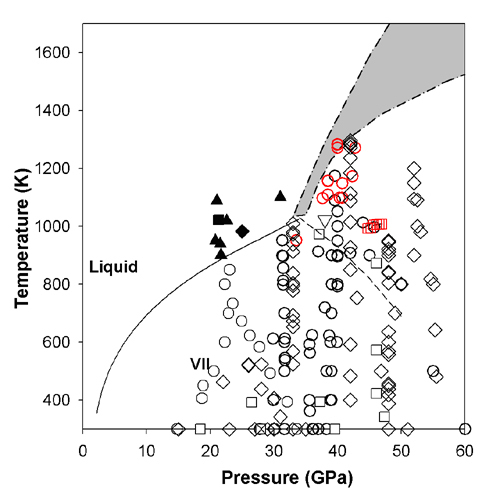 The team continued their work to higher pressures and temperatures, and they found that the melting curve of H2O increases significantly at above 35 GPa. The results provide direct and solid experimental evidence for the melting behavior of H2O under extreme conditions because the team not only used in situ Raman spectroscopy but also in situ x-ray diffraction to observe the change. These results unravel the mysterious behavior of water under extreme conditions and point out more needs of future experimental evidence to understand the rich behavior of H2O above the triple point. temperatures, Geophys. Res. Lett., in press (2005).